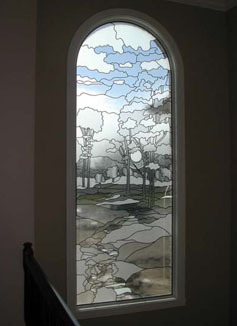 The Stained Glass Overlay product utilizes a unique process combining multiple materials (glass, lead, multi-layered polyester film, bevels, jewels, etc.) to form a solid piece of decorative art glass. The finished product has the look and feel of traditional stained glass, but with the strength and integrity of a solid piece of safety glass. Each piece is custom designed to meet the needs and desires of our individual customers and can be installed over, or in place of, existing glass. With over 300 colors and textures available and complete design flexibility, Stained Glass Overlay is a great solution for a wide range of decorative glass applications. Residential: bathroom/spa privacy windows, home entryways, kitchen cabinet doors, shower doors, room dividers, domes, ceiling panels, and more! Commercial: restaurant doors, booth dividers, wall tops and signage, office lobbies, casinos, and hotels, and more! Religious: new (or replacement) church windows, chapels, funeral homes, icons, and more! 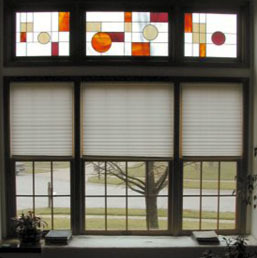 Stained Glass Overlay provides privacy while still allowing the transmission of light. The product is lightweight, seamless, air tight, water tight, and contains ultraviolet inhibitors to protect from fading. It meets building codes for safety glass and requires little maintenance. There is virtually no limit to the size and type of design that can be created and unsightly reinforcement bars are not needed. you'd like to do, we can help. Our design consultants have numerous tools and templates and are ready to assist you in developing your ideas. SGO Designer Glass specializes in custom stained glass, traditional cut glass, textured pattern glass, etched glass, shaded glass, llumar glass, embossed glass, classic antique mirror, and decorative laminate glass.